When an advisor meets a new client, marital status is one of the most important details requested. Numerous investment decisions are affected by an investor’s marital status. Similarly, when marital status changes with an existing client, investment decisions must be reviewed and changes need to be considered. When a client is approaching retirement or given thought to retirement income streams, advisors must consider the client’s marital status in making decisions and recommendations. As stated above, when a client’s marital status changes in or near retirement, significant decisions need to be made regarding current and future financial and investment choices. An investor who enters retirement married is a much different client than one who enters divorced, widowed or single. 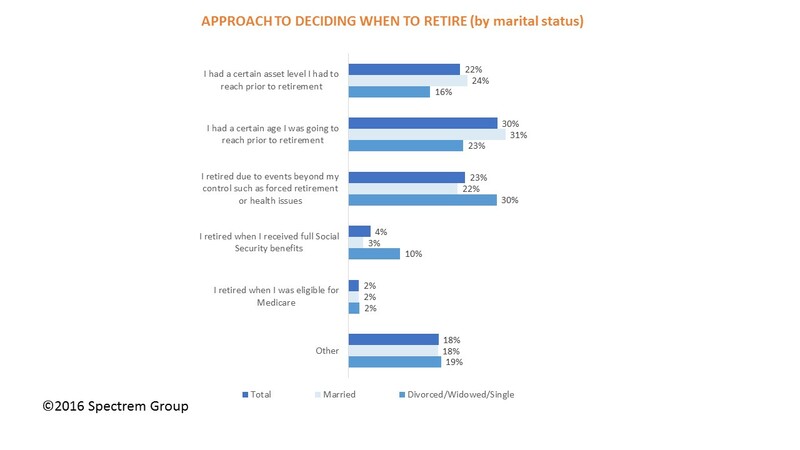 Advisors consider marital status with almost every decision when it comes to retirement income and savings. That’s why Spectrem’s newest study on retired investors, Financial Wellness in Retirement, segmented investors into two groups – married and divorced/widowed/single. The study looks at investors in several other segments - including age, length of time in retirement, and gender – but few breakouts are as uniquely different as those based on marital status. The Spectrem study not only conducted quantitative research to determine how the majority of retirees respond to questions, but also included qualitative research in the form of one-on-one and focus group interviews. It is in those interview sessions that the matter of marriage most often distinguished one investor from another. Starting with the decision to retire, married investors were more likely to plan retirement around a certain asset level reached or a certain age. Those not currently married were more likely to report retirement due to events beyond their control, such as forced retirement or health issues. Retirement for the investors not currently or ever married is also not as often blissful as it is for those who are married. Eighty-one percent of married retirees said retirement is better than expected, while only 71 percent of those not currently married felt the same way. One other clear aspect of the issue of marital status is concerns over health and aging. Married retirees get to worry about their spouse’s health, and presume to have someone to grow old with. Those who are not currently married have only themselves to worry about health-wise, and will be on their own when it comes time to make decisions about an eventual living arrangement. The qualitative portion of the Spectrem study illustrated the unique issues that retirees without spouses have. Those issues not include their own care and treatment down the line, but estate issues as well. Marital status can be complicated and can certainly entangle retirement plans. An investor has different financial needs and issues in retirement whether they are married, divorced, widowed or never married. Advisors need to be ready to assist investors in all four categories as they deal with Social Security benefits, alimony, separation of assets or wealth transfer matters. One topic that will come up with every retiree, eventually, is the cost of health and medical care. Advisors can provide assistance in this area even though it does not provide investment income to the investor. Supplemental insurance plans are as complicated as Medicare and Medicaid and elderly retirees need to be able to count on someone to point the correct direction for their medical needs.